Ted Ginn Jr. is considerably better as a Carolina Panther than he was as a receiver for the Miami Dolphins, San Francisco 49ers or Arizona Cardinals. Last season I asked him why. He talked about Carolina’s receivers room and his bond with receivers coach Ricky Proehl. Ginn is 31 years old and a 10-year NFL veteran. Proehl, 48, played 17 seasons in the NFL. Their styles differ. Proehl ran routes so precise you could plot them on a graph. No graph offers enough paper to track Ginn’s routes. He’s running past you, or he’s going to set you up and try. Ginn said that he felt as if Proehl was more of an older brother than a coach. Ginn, the fastest 31-year-old in the world – yes, the world – has been on a tremendous tear. In Week 11 he scored his first touchdown of the season on a 40-yard catch against New Orleans. In Week 12 he caught an 88-yard touchdown pass against Oakland. In Week 13 he caught a 55-yard touchdown pass against Seattle. Monday against he caught a 30-yard touchdown pass against Washington. Ginn was one of the best high school players in the country in Cleveland. He knew LeBron James. Or maybe LeBron knew him. They both dominated the surface on which they played. Ginn starred at Ohio State and the Miami Dolphins took him with the ninth pick in the 2007 draft. Ginn was good with Miami but not great. In three seasons he caught 128 passes for 1,664 yards and scored five touchdowns. The Dolphins traded him to the San Francisco 49ers for a fifth-round draft pick. He played three seasons for the 49ers and caught 33 passes for 384 yards, only one of them for a touchdown. Panthers’ general manager Dave Gettleman hired Ginn in 2013, and the hiring was an immediate success. Ginn fit in the receivers room, the locker room and on the field. Steve Smith, then Carolina’s star receiver, took him in. Smith became a huge proponent and worked to ensure that Ginn’s family would be comfortable in Charlotte. Smith, always so fast, even acknowledged that Ginn had a gear he didn’t. In 2014 the salary cap jumped and opponents flung money at several Carolina free agents. The one the Panthers least wanted to lose was Ginn. He followed the money to Arizona. The Arizona Cardinals didn’t hire him. They rented him. Ginn caught 14 passes for 190 yards, none of them a touchdown. In Charlotte, Ginn can do that in a half. 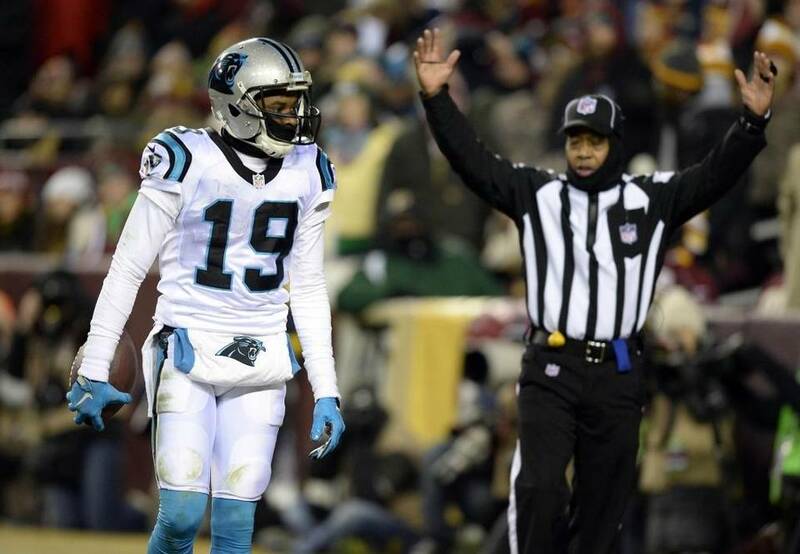 Ginn’s three-year totals at Carolina (with two games to play): 127 receptions, 1,949 yards, and 19 touchdowns. Ginn lacks, say, tight end Greg Olsen’s hands. But he gets open and defenses have to account for him. One reason Carolina overcame the loss of their (theoretically) top receiver Kelvin Benjamin to injury last season is because of Ginn and Philly Brown. When there’s a pair of 4.4 40-yard dash guys on the outside, life becomes easier over the middle. When you watch quarterback Cam Newton this season put all 245 pounds into a throw, you know where the ball is going. And you know it’s not going to be overthrown. I love watching Ginn run because he wastes nothing. He allows only the body parts that are supposed to move to move. I’ve had several greyhounds and they’re built for speed. They waste nothing – unless there’s a piece of bread or something on the sidewalk. Ginn, who ran a 4.3 out of college, is built for speed. I ran track in high school and, OK, he’d lap me in the 40. But I can appreciate what he does. I once asked Ginn when he last stepped onto on a football field with a player faster than he was. He looked at me as if I was insane. But he leaned against his locker and thought. How old was the other player?